Bees and other pollinators, according to the Food and Agriculture Organization (FAO), contribute between US $235 billion and US $577 billion to the annual global food production through pollination. But if a new study, published in the Journal of Applied Ecology, is anything to go by, then these unsung heroes of the ecosystem are under threat. This is when the US just lifted a ban on use of genetically modified crops and neonicotinoids chemicals, which were linked to the reduction of bee population, on national wildlife refuges. This ban was implemented by the Obama administration. The meta-study, titled ‘Quantifying the impact of pesticides on learning and memory in bees’ and published on July 10, looked into the results of 23 previous studies on the impact of pesticides on bees. The study confirmed that pesticides, even in the doses currently considered non-lethal for bees, are enough to “dumb” the pollinators down, severely deteriorating their forging abilities. “To protect agricultural crops from unwanted pests and diseases, we typically use a whole host of different insecticides and pesticides within agricultural environments. Insecticides are often insect neurotoxins, which means they act on the nervous system of invertebrates, which can potentially influence their cognitive ability,” says Harry Sivitera, a PhD student at Royal Holloway, University of London and the study’s lead author. This means that in a fight against pests through pesticides, bees are the ones becoming victims. On a normal working day, a worker bee leaves the hive and forges for nectar from flowers. To do this efficiently, not only does the bee needs to remember the way back to the hive, it also has to know which flowers have already been visited. The study has shown that exposure to pesticides can impact a bee’s memory and learning ability, which makes its forging work less efficient. The study also dispelled the myth that only neonicotinoid-insecticides affect bees. “Our results showed that both neonicotinoids and non-neonicotinoids have similar negative impacts on the learning and memory of bees,” says Harry Siviter, one the researchers. While the aspect of how the pesticides’ impact on bees is affecting food production has not been well documented, a 2016 FAO report points out that over the last 50 years “pollinator-dependent crops show lower growth and stability in yield than crops that do not depend on pollinators”. Prathib Basu, head of Centre for Pollination Studies at the University of Calcutta, agrees with the ways in which pesticides harm the pollinators. Basu and his team have been working on pollinators, including bees, for many years, and were the first ones to conduct an on-field study. “We have found that the pesticides affect the olfactory sense of bees, which hampers their forging ability. There is also evidence that shows a decline in the diversity of various species of bees in agrarian areas with high pesticide use, as opposed to non-agrarian areas,” he says. Basu, who has done most of his studies in the western part of India also says that use of pesticides, because of its impact on pollinators, becomes counterproductive. 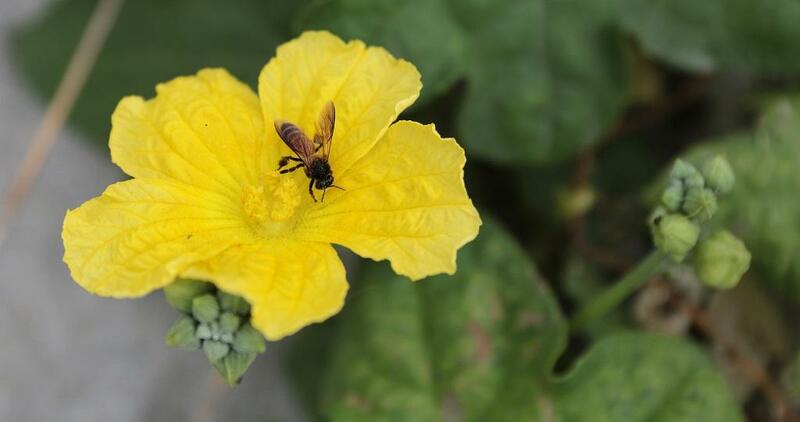 “We have data from Odisha which shows that as pesticides affected the performance of bees and other pollinators, crops of brinjal could not get the optimum amount of pollens for proper fructification, thereby decreasing the yield,” Basu says. The harmful effects of pesticides are also an important topic of discussion at the Central Bee Research & Training Institute at Pune. The institute was set up in 1962, under the Khadi and Village Industries Commission (KVIC), a statuary body aimed at creating employment and self-reliance among the poor. It provides guidance to people on apiculture. “We tell people to not let the bees out of the hive box on days pesticides are sprayed within 2 kms of the apiary, because if they do, bees die,” said Bokhade, a senior staff of the institute. The impact of pesticides on bees provides a worrisome picture for global food production, especially, as Basu says, 80 per cent of the food production depends on pollination by bees and other pollinators. “Pesticides also impact other pollinators and it is important to switch to non pesticidal management of crops, as is being done in some villages of Andhra Pradesh for some time now by the Centre for Sustainable Agriculture (CSA),” he says. In Andhra Pradesh, CSA’s experiments and studies have found that that pest is a symptom of ecological disturbance rather than a cause and can be affectively managed by using local resources and timely action. The use of pesticide in the bid to increase food production is harming the pollinators which help food grow. New alternatives to pesticides have to be found keeping in mind the bees for the food security of the world.